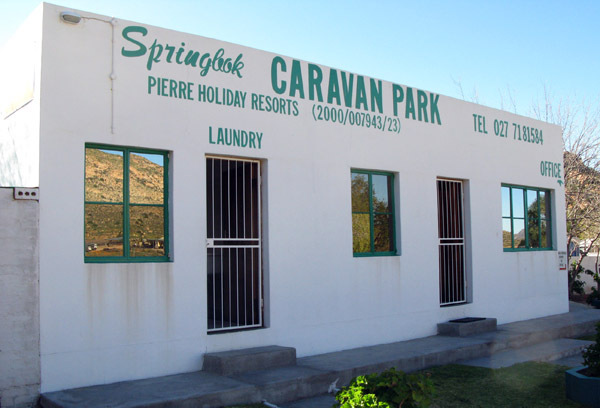 There are 2 caravan parks in Springbok. 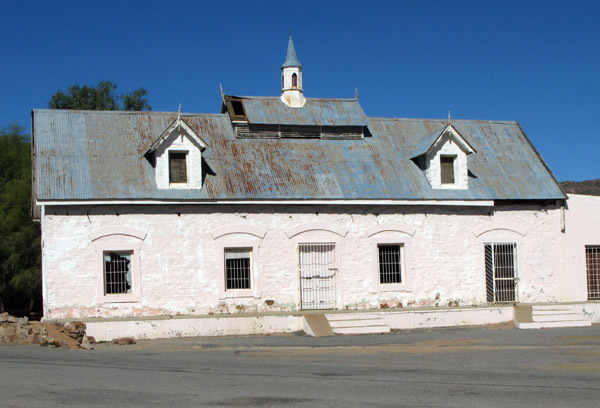 The one I mentioned in my first post here is the Kokerboom Motel and Caravan Park and the other is The Springbok Caravan Park. 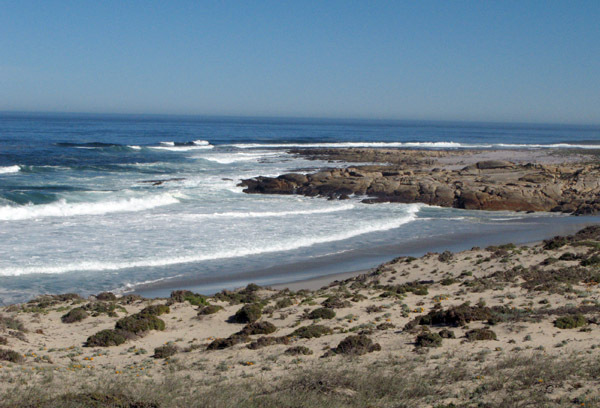 Both are situated just outside of Springbok but that is where the similarities end. 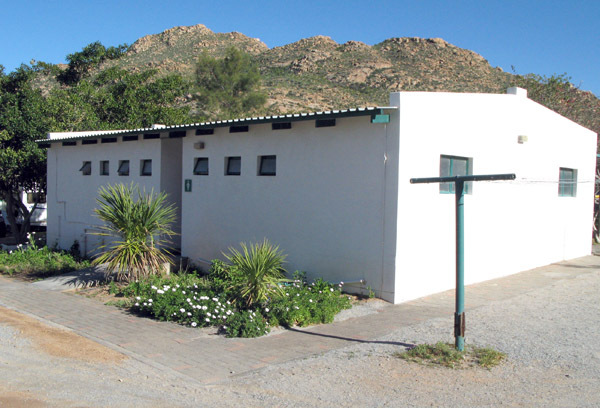 The Springbok Caravan Park is by far the more popular of the two and the main reasons are position – not smack bang next to the national road – and the really nice clean, well functioning ablution block. The manager is a young guy who seems to keep a beady eye on what is going on, not like many of the other park manager who don’t seem to give a damn, and they are upfront about what is and is not tolerated regarding noise after 10pm. The rules of the park are in bold typed notices stuck up in the ablution blocks for all to see and read. As you can see there is a laundry which has 3 washing machines and a tumble dryer. 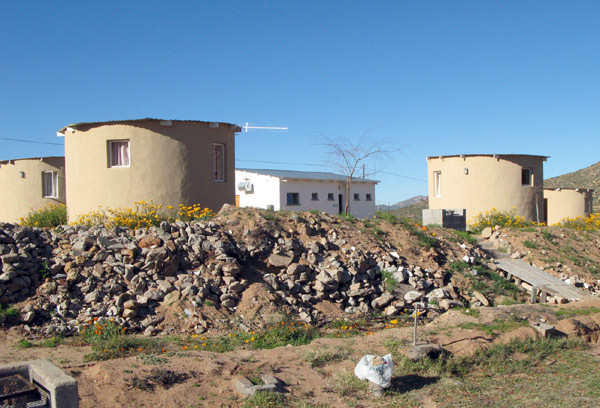 I got the impression that some of the residents of Springbok also make use of these facilities. I did 2 loads of washing for R20.00 and had my ironing done by one of the friendly ladies who would only charge me R35.00 for the lot. 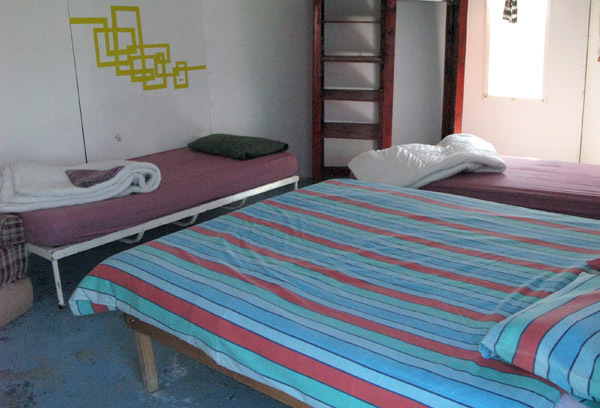 The door on the right is to a small self-contained flat which is also for hire. 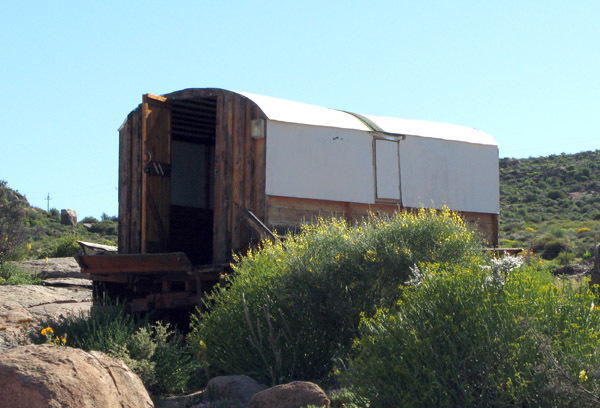 Everything was keep nice and clean, toilet paper was supplied – it took me about 2 days to get out of the habit of taking my own – and the showers not only had plenty of hot water, hooks to hang your things on but also had sliding shower doors so that all your goods did not get sopping wet. What a difference compared to the other parks I had been to previously. Popular section of the park. Check out the back drop! The set up closest to the camera on the right hand side had a rig worth over R800,00.00. If I had to criticise one thing it would be that I thought the sites were a bit cramped and close to one another. They also have chalets/rondawels most of which were occupied all the time I was there. Spoke to a young couple who slept one night in it and they said it was fine but a bit cramped. This shot was taken mid morning so many of the campers had already left. 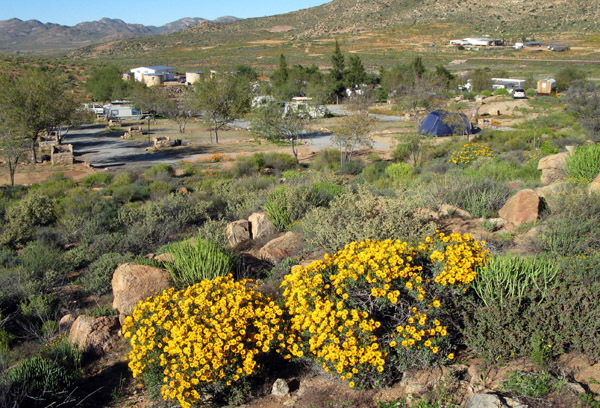 I enjoyed my 5 day stay at the Springbok Caravan Park. A lot of people only come in for one night on their way to or from Namibia or the Richtersfelt but there were a few, like myself, who used it as a base for a few days to explore Springbok and it’s surrounds. If I had to rate it out of 5 stars I would give it 3½. 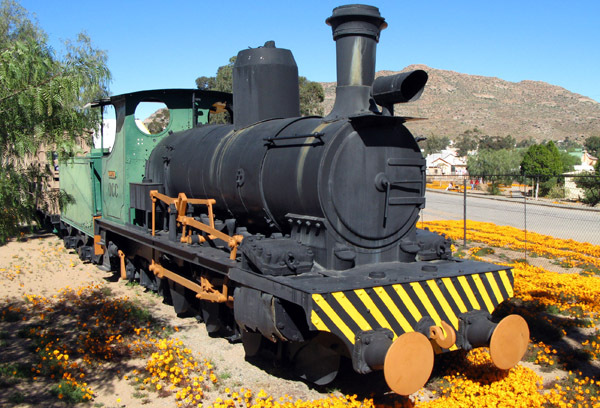 As a young man I used to travel up to Springbok from Cape Town every 6 weeks. I was working as a sales rep and this area was part of my territory. The roads then, from Bitterfontein up, were all gravel and not very good. Also everything that was brought into the area was transported on massive Jowells Transport trucks which made driving fairly hazardous. That was over 40 years ago and to be honest whilst the roads are now tar much of the town has not changed all that much. 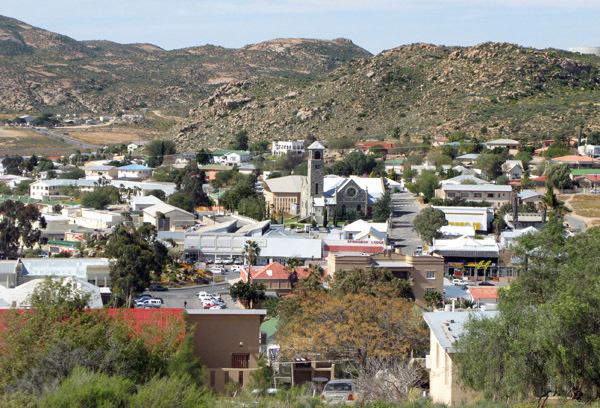 Springbok is the capital of Namakwa and also the administrative, commercial, farming and industrial centre. 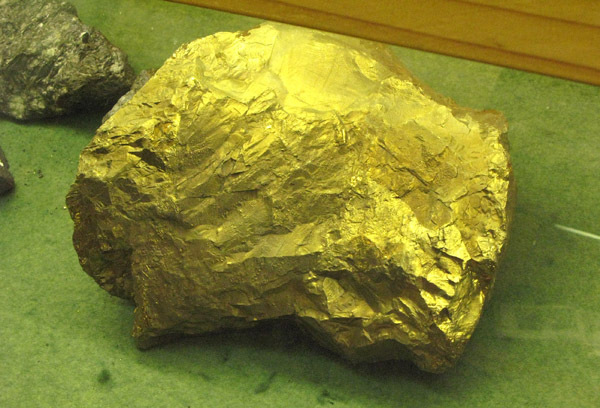 It is 550 km from Cape Town, 1274km from Johannesburg and 113km from the Namibian border. 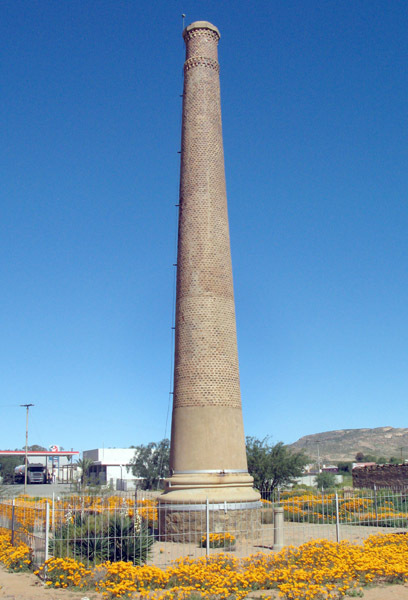 Its history is closely link to that of the copper industry and was the site of the first commercial mining operation in the country. 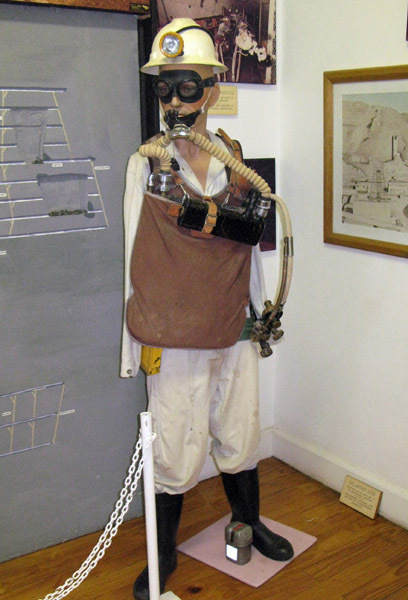 The first mine was brought into operation in 1852 and in 1862 the town of Sringbokfontein was laid out. 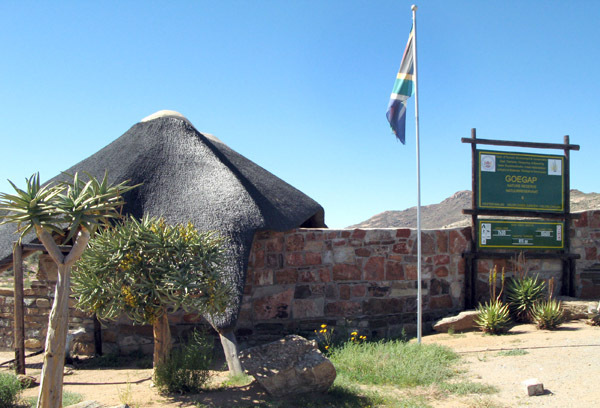 I have now been in Springbok for a few days, since travelling through from Port Nolloth, and am staying at the Springbok Caravan Park. 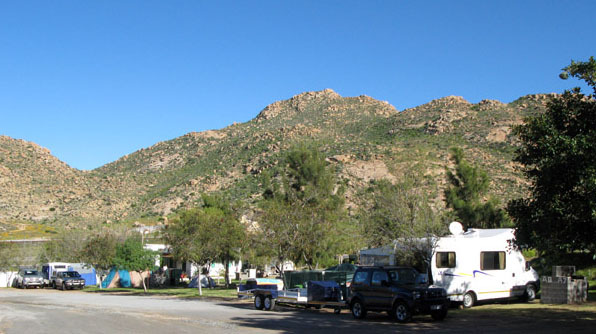 (I will do a post on the park soon) I really only wanted to cover the coastal areas of SA but now that I am here might just as well show you a bit of the town. 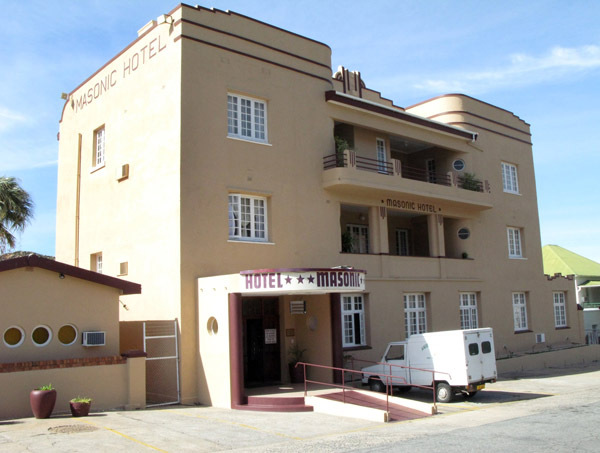 This is the hotel I always used to stay at on my travels. 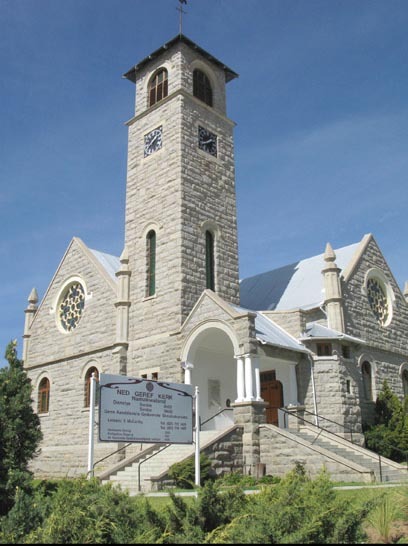 The Synagogue was completed in 1929 and is now used as the museum. 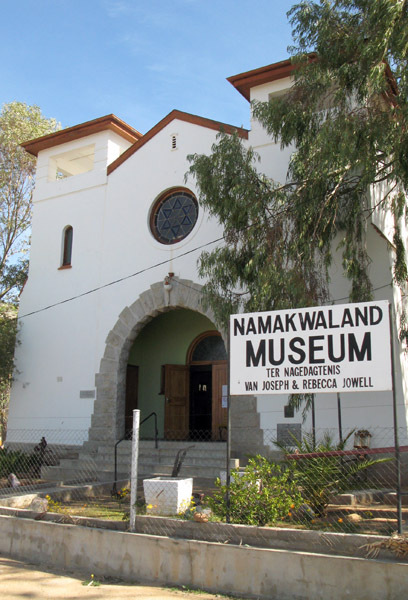 The involvement of the Jowell family is synonymous with the formation of modern day Springbok. 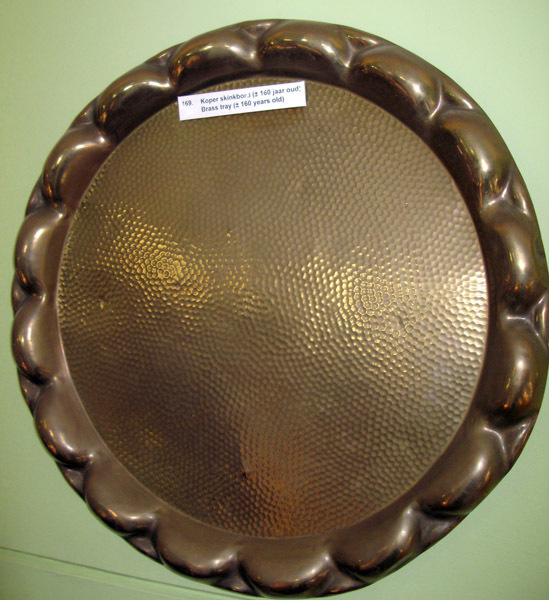 Copper tray of about 160 years old. 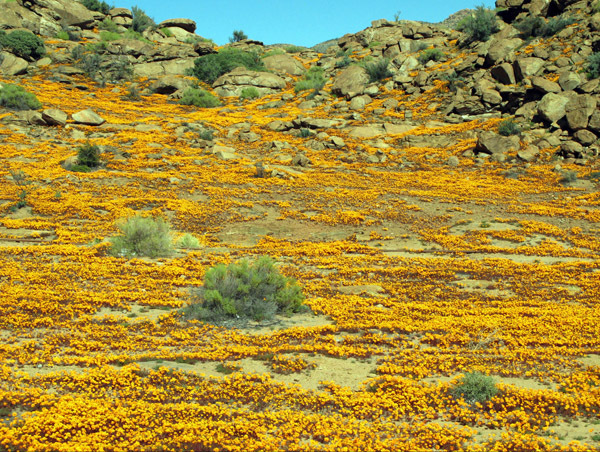 The flowers, so far, have not been too great but I did find this one patch close to Springbok. 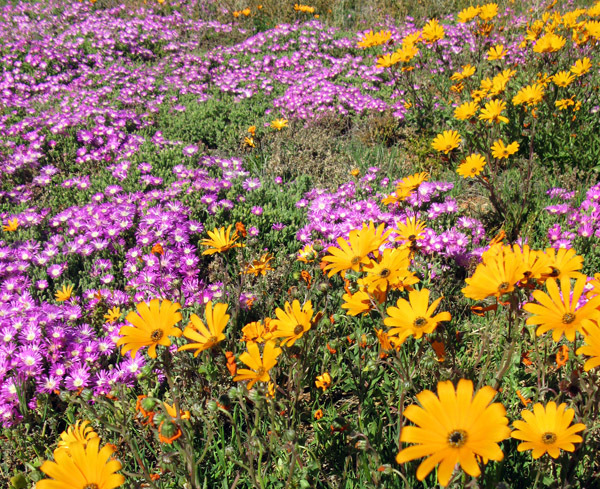 I am still hoping that as I travel towards Cape Town they will improve and I can do a whole post of flowers. 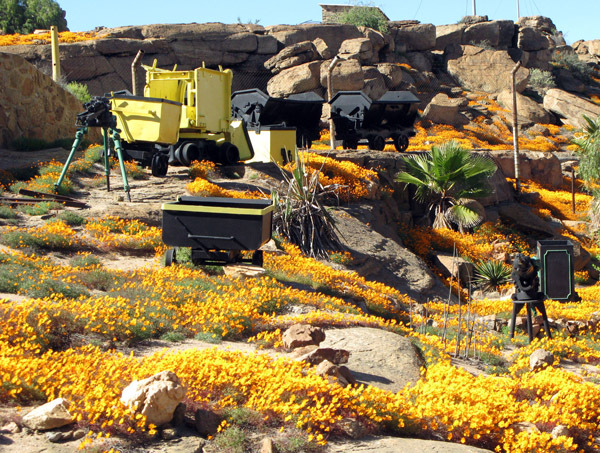 About 15km’s south-east of Springbok is the Goegap Nature Reserve which includes the Hester Malan Wild Flower Garden. I got there too late to go and have a look but believe it is well worth a visit so might try and go back later today. 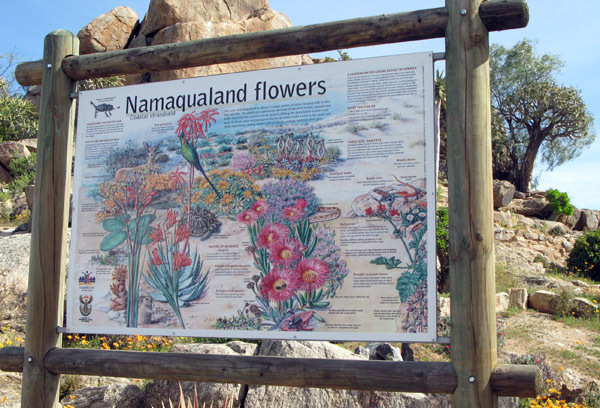 The entrance to the Goegap Nature Reserve. 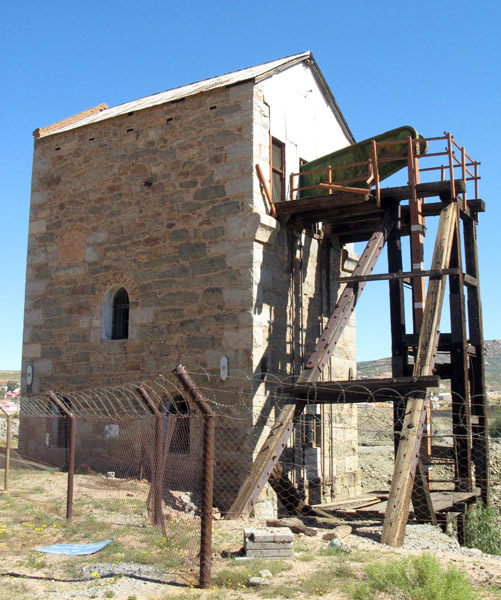 I have also been through to Okiep and Nababeep and will do a combined post about the 2 old copper mining towns in the area next. 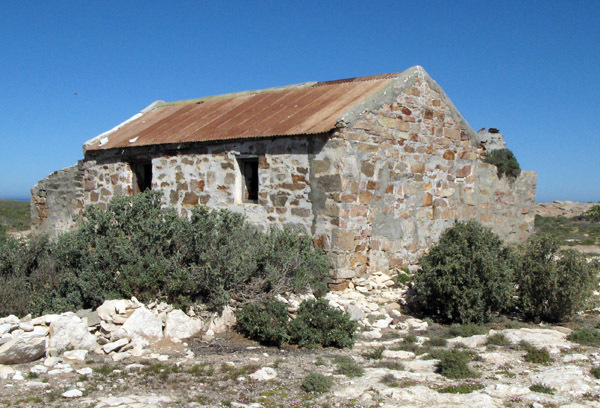 I am hoping to move down to Kamieskroon next and then head back to the coast, without the caravan as I believe the roads are pretty bad, and visit places like Hondeklip Baai and Groenriviermond. 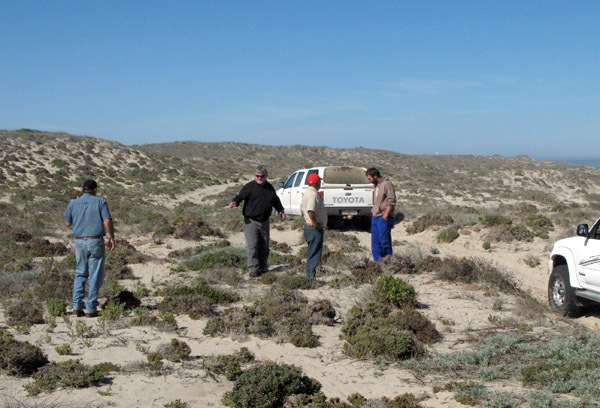 I met Bruce Wessels when he accompanied his father, Dudley, and I on the 4×4 Ship Wreck trail between Kleinzee and Koingnaas on my recent visit to Kleinzee. 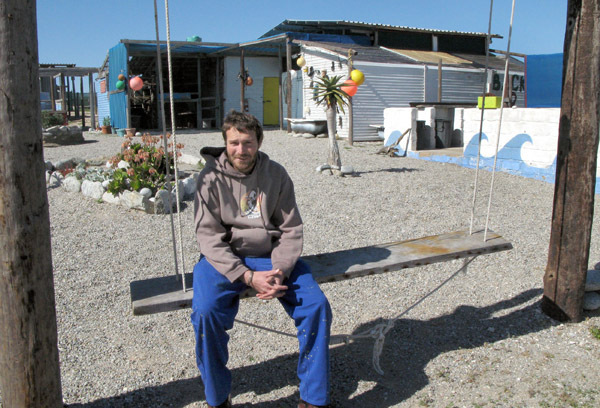 He has just recently, December 2008, opened a Backpackers a few km’s from Koingnaas aimed at budget travellers who are looking for good surfing, crayfish diving – in season and with a permit – walking trails and back to nature experiences. 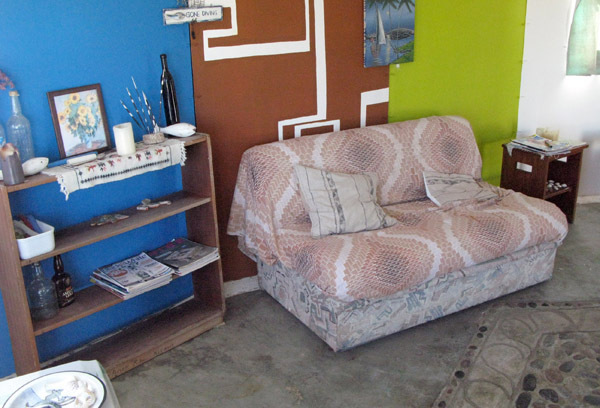 They charge R100 per person per night and there is a rather cool surf spot on the doorstep called Workshop or The Workshop. At the end of the 4×4 trail we dropped Bruce off and I had time for a quick look round and to take a few photographs. Originally there were 2 groups of diamond divers huts in this area and both have now been renovated into very pleasant accommodation establishments. 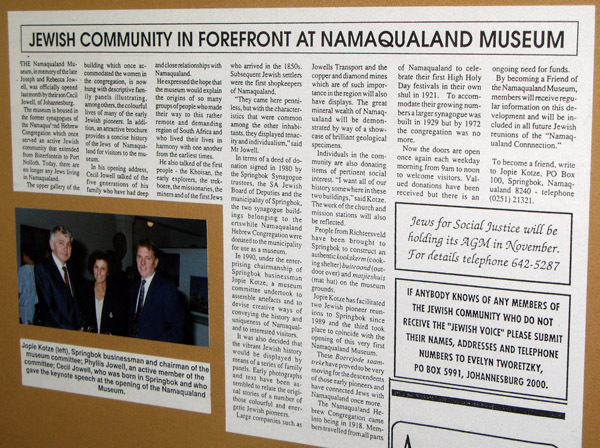 The first to be renovated was at Noup and is owned and managed by Bruce’s Mom and Dad. 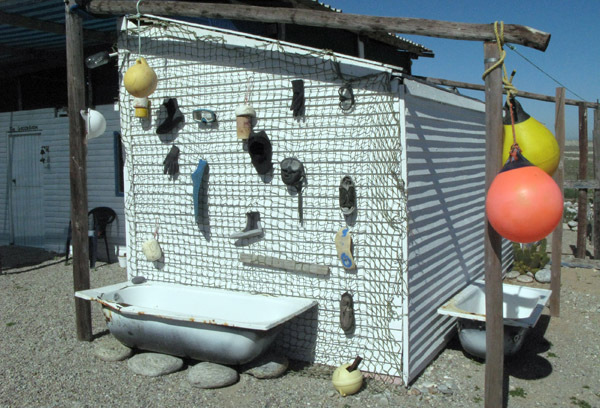 These are more upmarket self catering units with bathrooms en suite and epitomise the “on the beach” accommodation experience. Back to Basic Backpackers was the second group of huts to be renovated, basic but comfortable, self-catering huts just north of Noup. 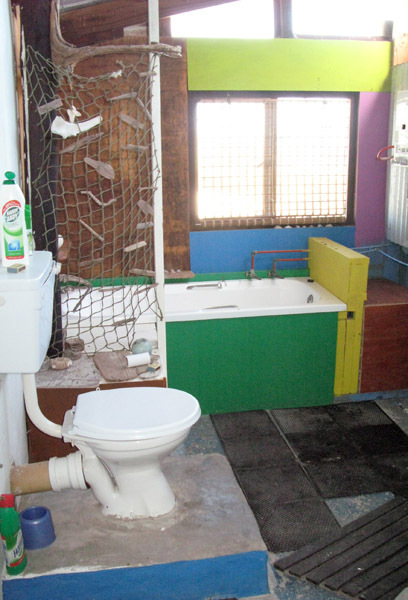 Communal bathrooms, kitchens and social areas make it ideal for small groups. 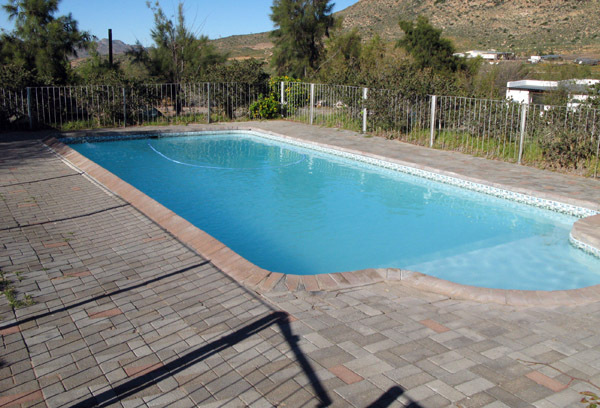 Limited electricity supply in the evenings, 7pm – 10pm, warm water, gas stoves and braai facilities. One of the larger huts which can sleep 4. 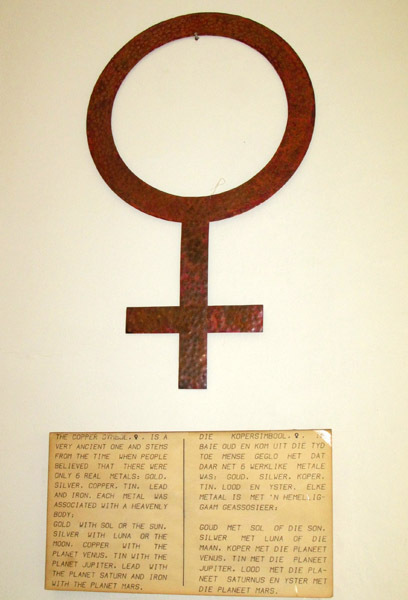 Some of the original decor. A reminder of the past? 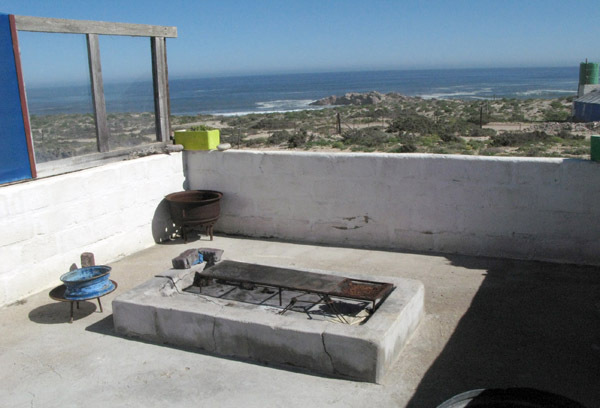 The lapa type braai area with the sea as your backdrop, ideal for sundowners. For the second part of my day in Kleinzee I was introduced to Dudley Wessels and his son Bruce. They were helping find suitable sites to erect camps for a new 4 day hiking trail that will hopefully be open to the public by the end of 2009. I was fortunate enough to be taken out by them on one of the great 4×4 routes along the coast for a couple of hours. 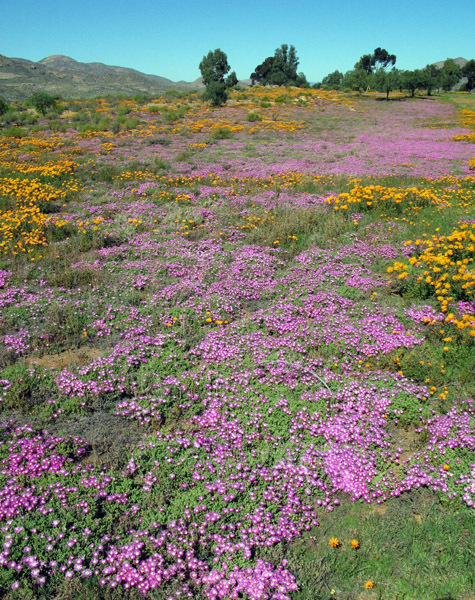 The area of land between Kleinzee and a place called Koingnaas 65 km to the south, is being utilised for many projects to provide meaningful and sustainable input into the economy of the region. 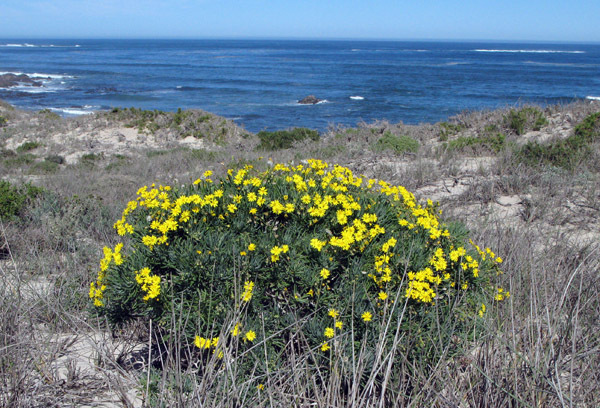 As mentioned the latest of these projects is a 4 day 80 km hiking trail which includes various habitats – strandveld, dunes and pristine coastal stretches. Discussing the suitability of an area as a camp-site. One of the beautiful bays. If I remember correctly this is the view one would have from one of the hiking camps. 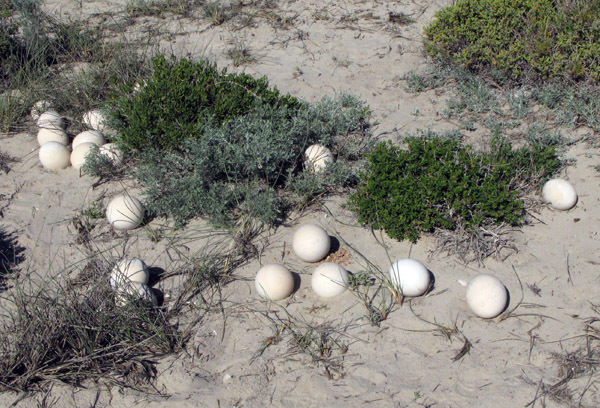 Reject ostrich eggs some of which are possibly 15 years old. Spot me if you can. 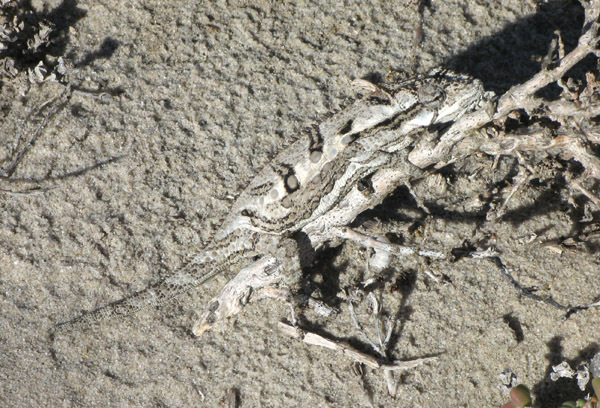 How on earth one of the guys spotted this chameleon I have no idea. 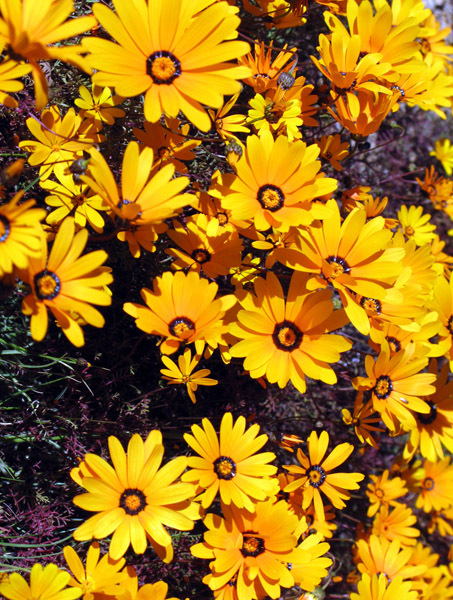 One of the many flowering daisy bushes along the way. Apart from the hiking trail there are 2 guided 4×4 trails. 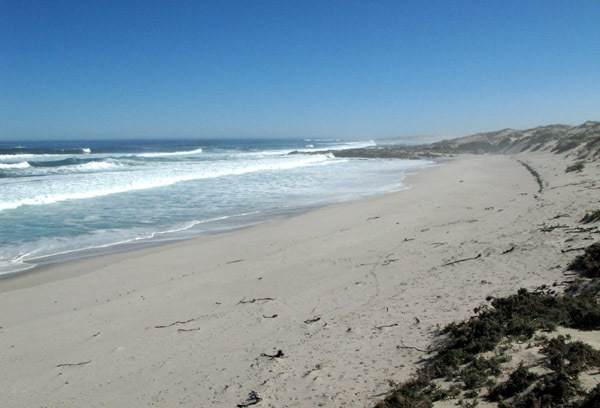 One is a 27 km dune drive, The Strandveld 4×4 Trail, which follows a sometimes almost invisible route through a 30,000ha private game reserve, two different dune systems and alternating veld. 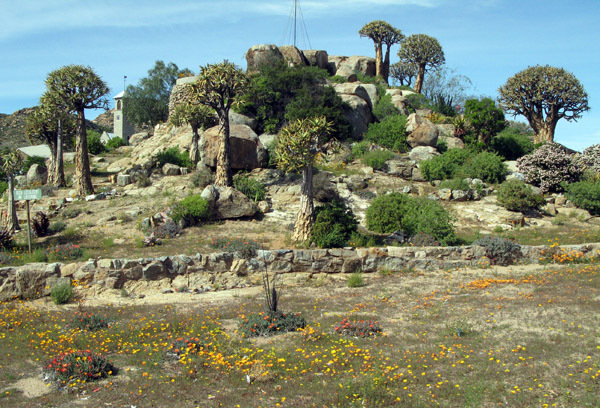 Ostriches, gemsbok, springbok and smaller antelope are common sights along the route. Unfortunately my time was limited so I did not go on this trail. The other 4×4 trail, The Shipwreck 4×4 Trail, was the one I was taken on and it was spectacular. The trail is pretty rough has a difficulty rating of 2-4, so it was a good thing I was not driving, and lasts about 5 hours. 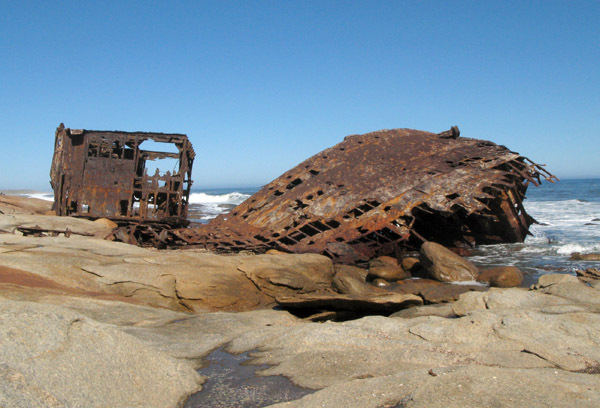 Over many years the stormy Atlantic Ocean has sent a number of ships to a chilly grave along the coast between Kleinzee and Koingnaas. 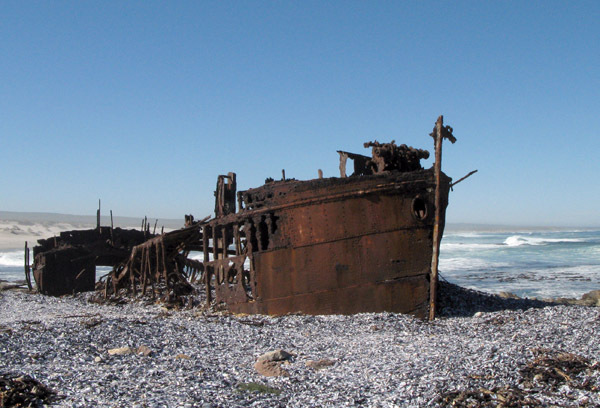 In June 1943 the 5000 ton Brazilian steamer Piratiny was wrecked at Schulp Point, about 80km south of Port Nolloth, while on a voyage from Brazil to Cape Town. Again no lives were lost and in fact they were able to salvage most of the cargo. The trail is not just all about shipwrecks and you travel past pristine beaches, archaeological sites dating as far back as the late Stone Age and historical sites such as the Agenbags stone house. “Die Kliphuisie” was built by a farmer on the farm “Zwart Duinen” in 1928, but he disappeared under mysterious circumstances in 1931. The next inhabitants were the Agenbag family. This quaint little farmhouse from a bygone era has been vacant since the Agenbags retired in 1976. 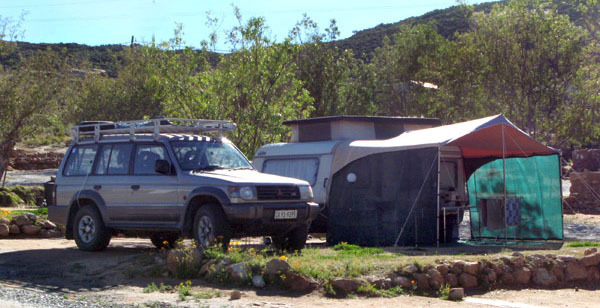 There are numerous places that one can stay at in the area, self catering guest houses, a backpacker and 2 caravan and camping parks – one at Kleinzee and the other at Koingnaas. 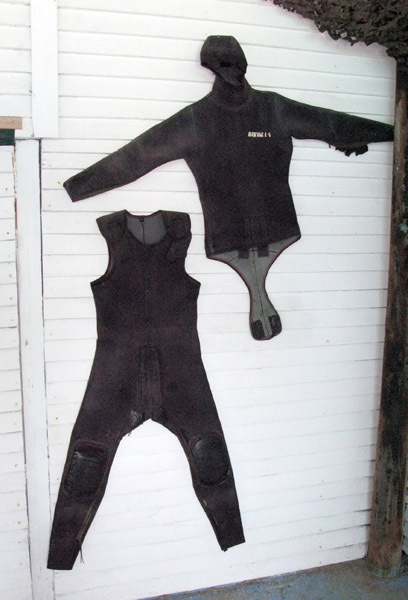 If I was looking for a good place to just chill out, go surfing, walking, cycling etc. this would be it.